The first Oniverse title leads you through a labyrinth. Will you wander in each room, hoping to find the door that will take you further, or will you let chance sort things out and trust in your luck? In both cases, you will have to deal with the slithering nightmares, which haunt the hallways of the labyrinth. Omnirim is a solo/cooperative card game: the player(s) must work (together) against the game, and gather the door cards before the deck runs out! 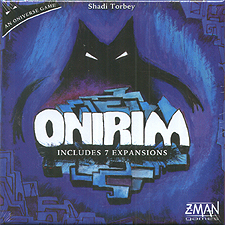 This box includes the basic game and 7 expansions.